I renewed the Domain name and the web site host for another year against my credit card. A copy of the invoice is below. Also , I learned the email address info@granitestatechapter.com is active and was being used by a few folks over the last couple of years. This address was not shown on our website but none the less , it had 50 or so emails in it. I responded to a few & cleaned them up. I will add a link to it on the website and check the account once in a while. I can share the access information if anyone else is interested in monitoring it. Here is a list of current forum members & their activity. Lemmo know if anyone needs to be adjusted or removed. The website has been modified to accept either NEW or RENEWAL membership payment thru Paypal online. Just in time for our April renewals. Click on the [become a member of the GSC] button and you will be taken to the DUES page. A similar button appears on the Members page. There you can make payment as a NEW member or a RENEWAL member. Credit cards are accepted if you do not have a Paypal account. 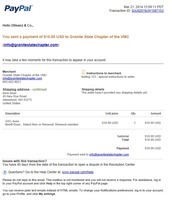 A confirmation email from Paypal will also appear in the Info@granitestatechapter.com account. This email will contain the paying member's name and address which can then be passed onto the membership officer and allow me to update the online database with the new paid-thru date. That one I did might be a bit off. Initially I had it as a "subscription" yearly auto-payment thing and then changed it to a one time payment. So after I tested it , and then cancelled it , and then redid it for a one time payment ... paypal might have dinged us twice. I can go thru the $ transfer process with you as soon as some other folks give it a shot and there is a paypal balance to deal with. The email below was received in the Info@granitestatechapter.com account. It might be nice to send them a club patch if we can spare one ? be kindly sent to us. you and your family a safe and peaceful remainder to 2014. Have a quiet one and thank you for your time. We should bring it up at the next meeting and put it to a vote. Being we have two sizes, you may want to ask what size they would like. If they are collecting and putting on a board the small one would probably be better. The fellow from the UK sent a thank you note for the club patch. really appreciate the help and kindness. That says it all really. So thanks again. I haven't figured out how yet, but our website has been hacked again. Spam web pages are being dropped into two of our picture folders redirecting uses to some stupid sales crap. This causes Google to send us nasty emails saying we're a dangerous site and blocks us. I cleaned it out again & changed the FTP password again. 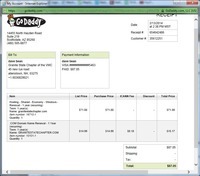 I plan to call godaddy tech support tonight and find out why. FYI: We received this email in our info@grantiestatechapter.com mailbox a while ago. My rsponse is below. I wanted to introduce myself to your club. I am the new Victory Rep for New England. I wanted to see if the previous rep had any involvement with your chapter and if you even allow manufacturer involvement in your club. If nothing else I'm always up for a good ride with good people. As far as i know , there has been no interaction with the local Vict rep.
We do however interact quite a bit with the local distributers. During the season we do rides to all of them to show our support. Hooksett Kawasaki recently joined us at our annual year-end banquet. Distributers are often listed as sponsers on our website and support the GSC club with small annual donations. You are of course welcome to join our rides or attend monthly club meetings. Can you send me the access info for the email? I'll try to keep an eye on it also. A few pictures of the Vt rally & Toy Run were posted on our Gallery page. I was only given a few pictures so if you have any more please send them my way.